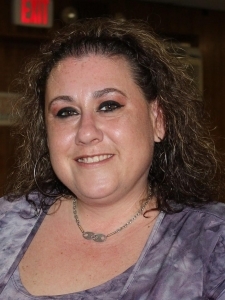 Dina Marie (Panfile) Shafer, age 42, of Chester, passed away peacefully in her sleep on Sunday, October 28th at home in Chester, PA. Born on April 8th, 1976, she was the second of three daughters born to Michael and Judy Panfile of Chester, PA.
Dina was a 1994 graduate of Cardinal O’Hara High School in Springfield, PA. She went back to college several years later as a non-traditional student and earned a BA from Immaculata University all while working full-time and raising her children. She was employed by State Farm as an underwriter for many years, and more recently rediscovered her passion of working with children when she started working in the Chichester School District. She spent many years assisting Christopher Council, and Delaware State Council, of the Knights of Columbus with her organizing, and cooking skills, at a multitude of events. She was instrumental in organizing an annual hayride which, in part, supports an organization for abused woman and children. With her uncle John, she initiated the annual ‘Italian Night’ with exceptional Italian fare and entertainment. She was very involved in the Christopher Council Ladies Auxiliary and held positions of leadership, including President. Everyone loved her food, but they loved her personality more. The Catholic Religion was very important to Dina. She was a fourth-generation parishioner of Immaculate Conception of Lourdes Church in Marcus Hook, PA, which her great grandfathers helped construct. She affectionately referred to Immaculate Conception as “my church,” until its closure in 2013. She has since been attending mass at both Saint Katherine Drexel, and Holy Rosary Churches, in Chester and Claymont. Dina’s life revolved around her relationships with others. Her daughter, her pride and joy, Michelle Nicole Shafer, was born in 1992. In 1994, she married Michelle’s father, David Shafer. She was subsequently divorced, and found love again with Joseph Cain. She and Joe were married in 2001, and she happily became the proud step-mother to Joseph, Justin, Destiny, and Jimmy Cain. Following Joe’s death she was lucky enough to find love yet a third time with James Henning. Her family grew even larger with two step-daughters, Jade Henning and Casey Collins, whom she always accepted as her own. In 2010, Dina’s dreams came true when she found out she would be a grandmother. In June of 2011, she welcomed Ava Rose, daughter of Michelle. Ava had a special bond with her “Nona,” a title Dina relished, and Dina always referred to her as “Ava my Rose.” She was so excited to have more grandchildren, including Dominic in 2013, born to Casey, and Rocco, born to Michelle this year. Dina was also an amazing aunt, and her nieces and nephew were always so happy to spend time with her. She was a wonderful friend to countless individuals, especially her two sisters, Michelle and Tia, and her long-time friends, Sarah Blochowsky and Melanie McClintock. A multitude of friends from the Knights of Columbus, and its home, The Brandywine Club, speak of how the room would brighten when she walked in, and all knew a good time was at hand. Everyone who knew Dina knew she was a big personality full of life, laughter, and movie quotes. She was passionate about music, art, and of course, dolphins and sharks. In fact, her favorite holiday was Shark Week. She loved to have fun, and she was frequently the first one out on the dance floor. Above all else, she loved spending time with family. She regularly was found cooking with dad and the grandkids, earning her the seat next to dad at the holiday dinner table. She especially enjoyed her time with the youngest of the family at these (and all) gatherings. Dina is survived by so many people who loved her, especially her adoring parents, Michael and Judy Panfile of Chester, PA; her daughter, Michelle Nicole Shafer (Ian Castellano), granddaughter Ava Rose Horn, and grandson Rocco Severino Castellano all of Allentown, PA; step-children Casey Collins and her son Dominic Carollo of Philadelphia, PA, Jade Henning and her son Brayden Shaner of Wilmington, DE, Joey (Candace) Cain and their children Kaylynn and Camden of Emmaus, PA, Justin (Meghan) Cain and their son Hunter of Croydon, PA, Jimmy Cain of Ambler, PA, and Destiny Cain of Aston, PA; partner, James Henning of Wilmington, DE; sisters and brothers-in-law Michelle (Albert) Ravert and Tia (Joshua) Murphy all of Chesapeake City, MD; nieces Anne-Marie Ravert of Elkton, MD and Marissa and Alexa Murphy (goddaughter) of Chesapeake City, MD; nephew and godson A.J. Ravert, currently serving in the U.S. Navy; great-nieces Skylar and Piper Ravert of Elkton, MD; godmother Anna Panco of Gaffney, SC; and many aunts, uncles, cousins, and friends. She is preceded in death by her beloved grandparents Frank and Helen Panfile formerly of Boothwyn, PA; her grandparents, Adel and Joseph Igo (who worked hard on her pronunciation of “ho, ho, bogie”); her uncle, godfather, best friend, and co-conspirator, John Panfile formerly of Linwood, PA; and cousin Cathy Barrett formerly of Harrisburg, PA. The family welcomes family and friends to the visitation on Sunday, November 4th from 6-8pm at Joseph A. Ward Funeral Home, located at 1459 Market Street, Linwood, PA, and again on Monday, November 5th from 9:30-10:30am at Immaculate Conception Church, located at 21 West 8th St., Marcus Hook, PA. Mass will follow at 10:30am at Immaculate Conception Church. A private burial will occur at a later date. My sincere condolences to the family of Dina. It breaks our hearts when death separates us from the ones we love so much. At times like these, “God is near to those who are broken at heart; And those crushed in spirit he saves.” (Psalm 34:18) We look forward with you to the time when we will be able to welcome our loved ones back! (John 5:28, 29) I hope this will bring you a measure of comfort. My deepest condolences to everyone, my thoughts and prayers are with you. Dina will always be remembered as the free-est spirit. She was the life of the party at all the family gatherings and always eager to lend a smile. I hope you are finding comfort in her love and the memories shared. Not a day will go by that you will not be missed just like not a day has gone by you weren’t loved. I love you always and am forever grateful for the ways you touched my life. Rest in paradise my sweet, sweet cousin and save me a seat. Many prayers and heartfelt condolences to your family on the loss of this exceptional young lady. Judy and Mike, our thoughts are with you at this very difficult time. Our sincere sympathy Mike and Judy, on the lost of your precious daughter, may our loving Lord give you comfort and strength, also to your family. I will miss you, things just won’t be the same without you, but I know you will be watching over everyone. Until we meet again love ❤️ Rest easy. My deepest condolences to your family at this very difficult time. I will keep you all in my prayers. I’m so sorry for your lost myh deepest condolences go out to you all. R.I.P. Dina. Heaven just gained their shining 🌟 star comedian. Keep them laughing girl. You will be missed. My deepest condolences to the Panfile family. We are sorry for your loss. We will miss you Dina! Enjoyed meeting you at the Rapposelli reunion and then our daily relationship on Facebook. Will miss your sense of humor. Prayers for all those you leave behind. Your memories will live forever! !